The Constitution had been written and signed by the time that Thomas Jefferson and James Madison engaged in a fascinating correspondence about a bill of rights. 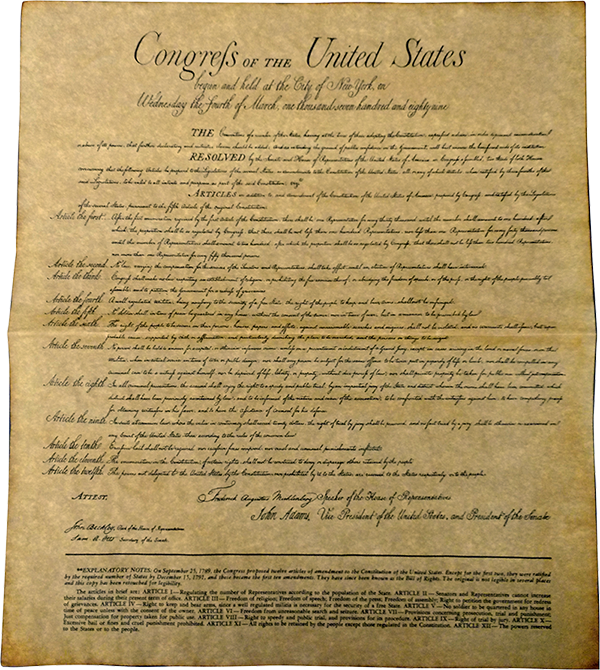 Much of the opposition to ratification had centered around the failure of the Constitutional Convention in Philadelphia to include a bill of rights in the original document. 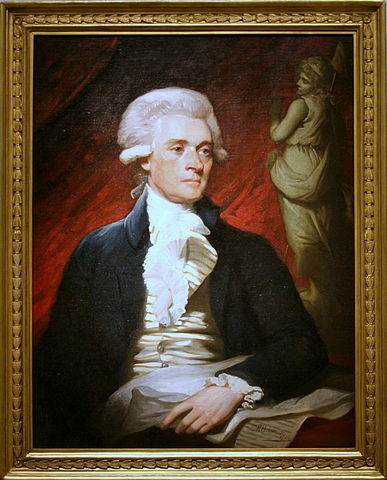 In many of the states, ratification came only after the Anti-Federalist secured promises that the First Federal Congress would consider amendments to protect the liberty of the people. 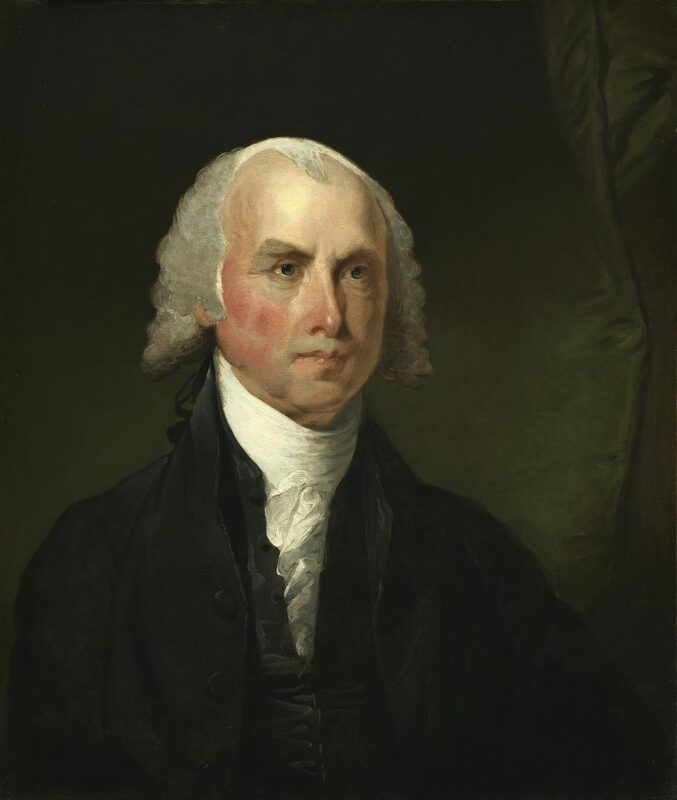 Although he later became the primary author of the Bill of Rights, Madison expressed serious doubts about the wisdom of amendments securing rights. Among other reasons, Madison believed that state bills of rights were little more than “parchment barriers” that were often ignored by “overbearing majorities in every State,” and that a federal bill of rights would fare no better. 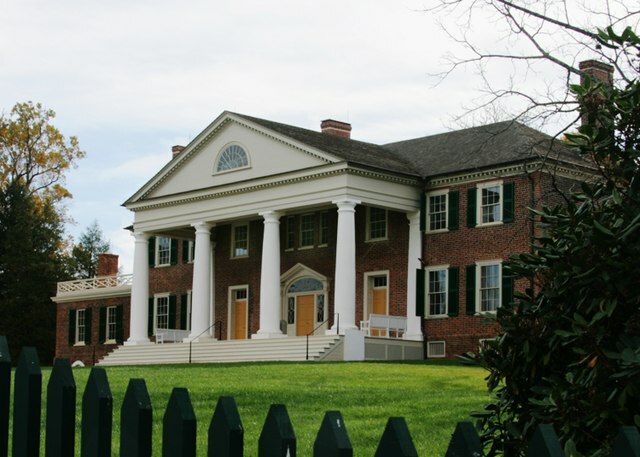 Nonetheless, Madison would secure ratification in the Virginia convention on a promise to pursue amendments in the First Federal Congress, and he made good on his word by becoming their principal author. “The season admitting only of operations in the Cabinet, and these being in a great measure secret, I have little to fill a letter. I will therefore make up the deficiency by adding a few words on the Constitution proposed by our Convention. I like much the general idea of framing a government which should go on of itself peaceably, without needing continual recurrence to the state legislatures. I like the organization of the government into Legislative, Judiciary & Executive. I like. . .
“The little pamphlet herewith inclosed will give you a collective view of the alterations which have been proposed for the new Constitution. … It is true nevertheless that not a few, particularly in Virginia have contended for the proposed alterations from the most honorable & patriotic motives; and that among the advocates for the Constitution, there are some who wish for further guards to public liberty & individual rights. As far as these may consist of a constitutional declaration of the most essential rights, it is probable they will be added; though there are many who think such addition unnecessary, and not a few who think it misplaced in such a Constitution. There is scarce any point on which the party in opposition is so much divided as to its importance and its propriety. My own opinion has always been in favor of a bill of rights; provided it be so framed as not to imply powers not meant to be included in the enumeration. At the same time I have never thought the omission a material defect, nor been anxious to supply it even by subsequent amendment, for any other reason than that it is anxiously desired by others. I have favored it because I supposed it might be of use, and if properly executed could not be of disservice. I have not viewed it in an important light 1. because I conceive that in a certain degree, though not in the extent argued by Mr. Wilson, the rights in question are reserved by the manner in which the federal powers are granted. 2. because there is great reason to fear that a positive declaration of some of the most essential rights could not be obtained in the requisite latitude. I am sure that the rights of Conscience in particular, if submitted to public definition would be narrowed much more than they are likely ever to be by an assumed power. One of the objections in New England was that the Constitution by prohibiting religious tests opened a door for Jews Turks & infidels. 3. because the limited powers of the federal Government and the jealousy of the subordinate Governments, afford a security which has not existed in the case of the State Governments, and exists in no other. 4 because experience proves the inefficacy of a bill of rights on those occasions when its controul is most needed. Repeated violations of these parchment barriers have been committed by overbearing majorities in every State. In Virginia I have seen the bill of rights violated in every instance where it has been opposed to a popular current. Notwithstanding the explicit provision contained in that instrument for the rights of Conscience it is well known that a religious establishment wd. have taken place in that State, if the legislative majority had found as they expected, a majority of the people in favor of the measure; and I am persuaded that if a majority of the people were now of one sect, the measure would still take place and on narrower ground than was then proposed, notwithstanding the additional obstacle which the law has since created. Wherever the real power in a Government lies, there is the danger of oppression. In our Governments the real power lies in the majority of the Community, and the invasion of private rights is cheifly to be apprehended, not from acts of Government contrary to the sense of its constituents, but from acts in which the Government is the mere instrument of the major number of the constituents. This is a truth of great importance, but not yet sufficiently attended to: and is probably more strongly impressed on my mind by facts, and reflections suggested by them, than on yours which has contemplated abuses of power issuing from a very different quarter. Wherever there is an interest and power to do wrong, wrong will generally be done, and not less readily by a powerful & interested party than by a powerful and interested prince. The difference, so far as it relates to the superiority of republics over monarchies, lies in the less degree of probability that interest may prompt abuses of power in the former than in the latter; and in the security in the former agst. oppression of more than the smaller part of the society, whereas in the former it may be extended in a manner to the whole. The difference so far as it relates to the point in question—the efficacy of a bill of rights in controuling abuses of power—lies in this, that in a monarchy the latent force of the nation is superior to that of the sovereign, and a solemn charter of popular rights must have a great effect, as a standard for trying the validity of public acts, and a signal for rousing & uniting the superior force of the community; whereas in a popular Government, the political and physical power may be considered as vested in the same hands, that is in a majority of the people, and consequently the tyrannical will of the sovereign is not [to] be controuled by the dread of an appeal to any other force within the community. What use then it may be asked can a bill of rights serve in popular Governments? I answer the two following which though less essential than in other Governments, sufficiently recommend the precaution. 1. The political truths declared in that solemn manner acquire by degrees the character of fundamental maxims of free Government, and as they become incorporated with the national sentiment, counteract the impulses of interest and passion. 2. Altho’ it be generally true as above stated that the danger of oppression lies in the interested majorities of the people rather than in usurped acts of the Government, yet there may be occasions on which the evil may spring from the latter sources; and on such, a bill of rights will be a good ground for an appeal to the sense of the community. Perhaps too there may be a certain degree of danger, that a succession of artful and ambitious rulers, may by gradual & well-timed advances, finally erect an independent Government on the subversion of liberty. Should this danger exist at all, it is prudent to guard agst. it, especially when the precaution can do no injury. At the same time I must own that I see no tendency in our governments to danger on that side. It has been remarked that there is a tendency in all Governments to an augmentation of power at the expence of liberty. But the remark as usually understood does not appear to me well founded. Power when it has attained a certain degree of energy and independence goes on generally to further degrees. But when below that degree, the direct tendency is to further degrees of relaxation, until the abuses of liberty beget a sudden transition to an undue degree of power. With this explanation the remark may be true; and in the latter sense only is it in my opinion applicable to the Governments in America. It is a melancholy reflection that liberty should be equally exposed to danger whether the Government have too much or too little power, and that the line which divides these extremes should be so inaccurately defined by experience. 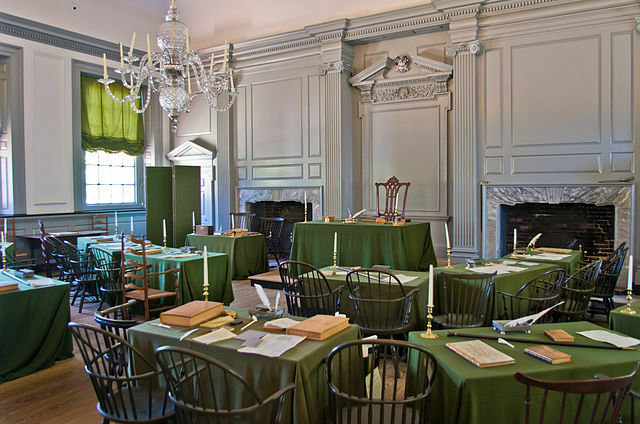 Independence Hall’s Assembly Room, where both the Constitution and Declaration of Independence were debated and signed. 1 Original source: The Papers of James Madison, vol. 10, 27 May 1787–3 March 1788, ed. Robert A. Rutland, Charles F. Hobson, William M. E. Rachal, and Frederika J. Teute. Chicago: The University of Chicago Press, 1977, pp. 205–220.